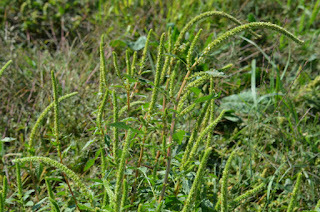 Following yesterday’s confirmation of the presence of Palmer Amaranth (Amaranthus palmeri) in Yellow Medicine County, University of Minnesota Extension and the Minnesota Department of Agriculture (MDA) sent out a joint news release describing where this plant was detected, photos to assist in identification, the biological reasons why this weed is on the MDA’s Prohibited – Eradicate Noxious Weed list and why efforts to eradicate this weed are critical to Minnesota’s commodity crop producers. 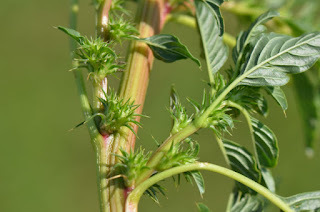 The legal status of "Prohibited- Eradicate Noxious Weed" means that the plant must be destroyed and no transportation, propagation, or sale of this plant species is allowed. This law gives MDA, county, city and township officials the right to inspect land areas believed to be affected by this weed and to ask owners to destroy the plants. To facilitate awareness of possible infestations, you can report by contacting the MDA’s Arrest the Pest line by phone at 1-888-545-6684 or by email at arrest.the.pest@state.mn.us. This weed law also provides a means of allowing MDA officials to investigate where potential sources of contamination of seed lots are occurring. Why should a farmer, landowner, or crop consultant report to Arrest the Pest? In my role as a weed scientist over the last 40 years, I have never approached a weed management issue with the intent of eradication, because most of the weed species in our commodity crops have been present in the soil weed seedbank for many years. This situation is different. This is the first detection of this weed species in the state; we have a good idea of the current sites of establishment; it is still possible to find the source(s) of seed contamination and if we respond quickly, we should be able to reduce weed seed production and spread. We have a very short timeframe in which to accomplish eradication, but due to the economic significance of this invasive weed I believe it is worth our collective effort to try. First, scout your fields with a particular focus on native seed planting areas. 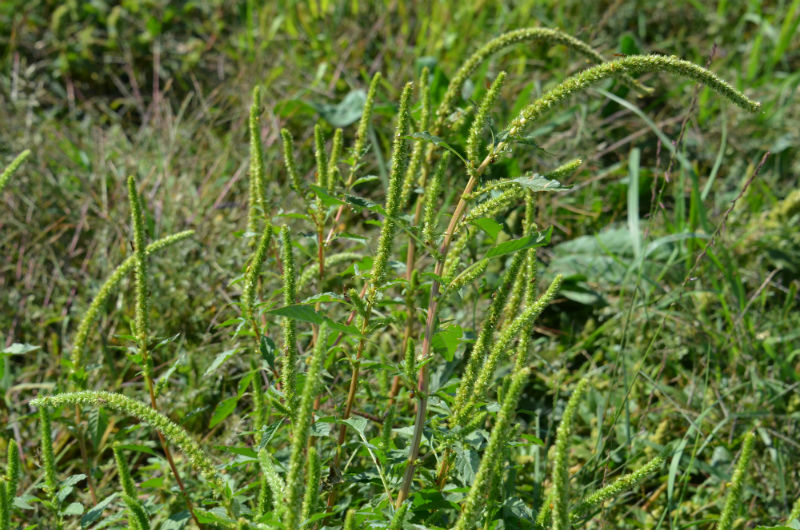 Look for pigweed plants that can obtain heights of 6- to 7- feet in height (in unmown areas), have an inflorescence (i.e. seed head) several feet long (Photo 1) and the female inflorescence has spiny bracts that are sharp to the touch (Photo 2). 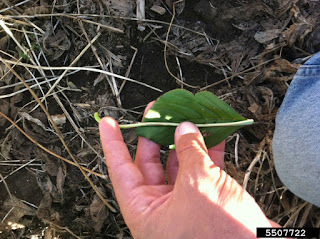 Also in a majority of the leaves, the petioles (the structure attaching the leaf to the stem), when folded over the leaf, are longer than the leaf (Photo 3). 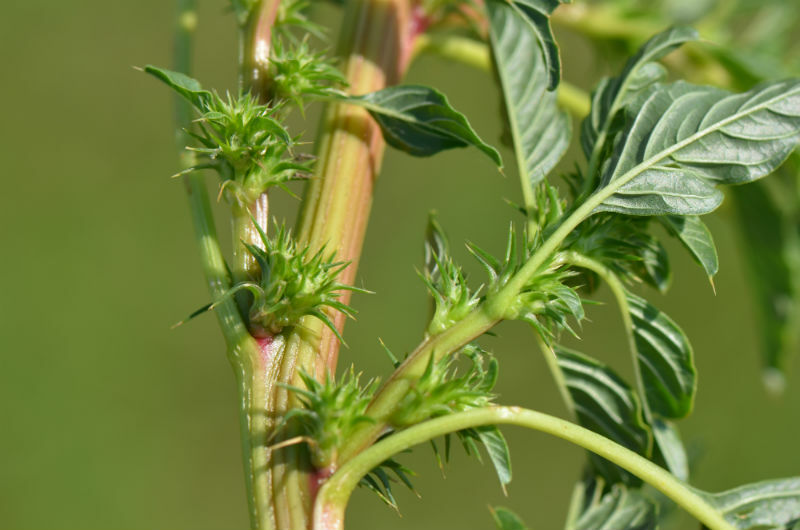 If you suspect the weed to be Palmer Amaranth, take photos similar to Photos 1-3 and submit to arrest.the.pest@state.mn.us and report the location of the pest as specifically as possible, your contact information, seed source (if known) and a description of the area in which the plant was found. This will help the MDA understand the current distribution of the weed and the potential to spread to your fields and to adjacent lands. Reporting will also allow local officials to help monitor the site in subsequent years to make sure there were no escapes. This is of particular importance if land ownership changes in the near future. After photographing and reporting, destroy the plants in question. If the population is small in number, hand weed, place the plants in a large paper bag, and remove it from the field to a site where you can burn the plant. Again, weed it, bag it, drag it, and burn it. Please don’t take "drag it" literally, it just makes things easier to remember. For a larger population of plants in an affected area at this stage of the weed’s life cycle, mow the area and clean off the mower on-site to prevent the spread of any weed seed shed onto the mower. Mowing does not kill the entire plant but it will keep the seed on the ground in the affected area where insects and rodents can feed on the seed and mowing will reduce movement away from the affected area. Also, any seed that germinates next year will have to compete with the more established plants that surround it. It will be important to closely monitor the affected and surrounding area next year to make sure there are no weeds that escaped detection or seeds that have moved into adjacent lands. By reporting your affected site to the MDA they will be able to assist you in this monitoring procedure. Finally, I want to emphasize that we have a very short timeframe in which to accomplish eradication, but due to the economic significance of this invasive weed, I believe it is worth our collective effort to try.